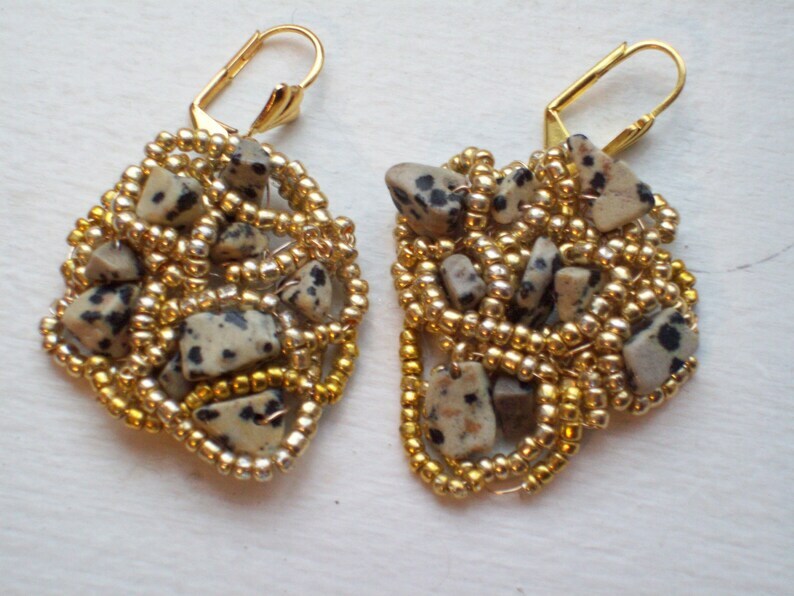 These earrings are made with a knitted base made of what I believe to be Dalmation Jasper chips and goldtone wire. Then I take gold seed beads and "sew" them around the chips to give them a little glitz. The chips are a soft off-white with black and brown spots.They are attached to a lever-back earring wire and are very comfortable to wear. The earrings measure approximately 1 1/4" long and the same at their widest point. These are truly one-of-a-kind pair of earrings. However, if these colors are not your favorite, contact me and we can design one in the colors you would prefer.